An enterprise content management solution can help health systems meet both clinical and business objectives. As healthcare organizations continue to eliminate paper, a rising tide of digital documents is giving HIM professionals reason to pause. There’s no question that clinical departments and others, such as registration, billing, and human resources, are reaping the benefits of digitization, but unstructured content—content that’s created outside of the EMR—is often not available in a centralized location or readily accessible. Because of the increasing need for sharing documents enterprisewide, this is a concern healthcare organizations are being forced to confront. The ability to digitize paper records has been a boon to HIM departments, but organizing and disseminating an ever-growing volume of electronic documents can be daunting. Although most HIM departments no longer need to search through rows of filing cabinets for needed documentation, multiple repositories for digital documents can present just as much of a challenge. To complicate matters, multiple departments may require the same documents. 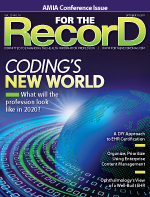 “I think the challenge of the past is that even though organizations may be moving to electronic medical record environments, they’re able to see the discrete data that’s been populated in that electronic medical record but they’re not able to see or access [that] unstructured content,” says Susan deCathelineau, MS, RHIA, senior manager of healthcare solutions for Hyland Software in Westlake, Ohio, and a former HIM director. Many healthcare systems are just beginning to grapple with this issue. For example, Main Line Health System in Bryn Mawr, Pa., has begun discussions through its medical record committee to better understand how both structured and unstructured content should be organized and accessed beyond the legal medical record. System Director of HIM Suzanne Layne, RHIT, says it’s quickly becoming apparent this issue has ramifications for the entire organization. Currently, Main Line Health System, which uses Siemens’ Soarian, NextGen’s Ambulatory EHR, and Cerner’s Millennium at selected sites to handle these data, is considering a systemwide approach. deCathelineau says the need to navigate through this environment provides an opportunity for HIM departments to take a leading role. The need to provide quick and secure access has never been greater and the responsibility to ensure that documents are available across the healthcare spectrum falls on HIM. HIM managers are well placed to shape an organization’s ECM policies because of their experience working with disparate departments and their knowledge of HIPAA and privacy laws. Also, because HIM tends to be the department of last resort when an unfamiliar document turns up, it ends up being the hub for a wide range of unclassified documents. Whether or not an organization has an EMR, it can still benefit from an ECM solution. Wythe County Community Hospital in Wytheville, Va., has a hybrid environment, but it uses Laserfiche’s ECM solution to make clinical content, such as electrocardiogram (EKG) results, available electronically. The solution has allowed the facility to split radiology, lab, and cardiology results into different sections under electronic tabs to give emergency department (ED) physicians easier access. Additionally, the hospital has used the ECM solution to centralize patient charts and organize outpatient records. Clinical referred labs, outpatient ED visits, same-day surgeries, advanced directives, living wills, and medical power of attorney documents are available 24/7 to authorized individuals. Physicians can sign orders electronically, which has been helpful in meeting federal requirements to sign, date, and time every order. When working with local nursing homes, Wythe physicians are able to sign an order for an x-ray or test, and the ECM checks the criteria to make sure it’s the correct physician for the correct location and facility and autofaxes it to the nursing home, eliminating the need for a physician to sign the same order at the hospital and at the nursing home. Other ECM solutions also allow electronic signing. For example, at SSM St. Joseph Health Center in St. Charles, Mo., and SSM St. Joseph Hospital West in Lake St. Louis, Mo., where Hyland’s OnBase ECM solution directly interfaces with the EMR, electronic signing has significantly improved the efficiency of report completion, according to HIM supervisor Amy Welker, RHIT. Physicians are able to sign 95% of required documents, and the facilities can create document groups that feature only documents requiring signatures. Prior to implementation, the facilities required more than 14 daily employees, six on standby, and one temp, with overtime required. Now, staffing needs have shrunk to 8.6 daily employees with no standbys, temp, or overtime. In addition, when signatures are required, the facilities are able to electronically notify physicians, who don’t have to visit the HIM department to complete the task. “The physician can utilize the electronic health record to view his in-basket to see what efficiencies need his action, including those scanned documents that need his signature, and he can take action right there in the electronic health record; the interfaces are all there,” says Welker. Besides documents that have traditionally been produced on paper, ECM allows multiple forms of media to become part of the patient record. Photos, videos, and content from clinical systems can also be captured. Making this information quickly and easily available to clinicians has the potential to improve patient care. ECM systems also make it easier to find documents that are accidentally filed in the wrong patient’s chart, a feat that is nearly impossible with paper documents. ECM efficiencies are not limited to the clinical side. The technology can aid patient registration by allowing insurance cards and electronic consent forms to be added to a patient’s record. The business office can track billing information and invoices. Human resources can use ECM to store résumés while the medical staff office can maintain credentialing files. Having all this information available in a single, searchable repository can help an organization gain efficiencies and reduce paper storage and destruction costs while ensuring quality and security. Providing better structure can result in significant time-savings. At Wythe, finance process automation has reduced the amount of time spent reviewing operation reports. An HIM employee used to spend 10 or 11 hours each month printing reports, separating them by department, and putting them in envelopes. Now that the process has been automated, it takes 20 minutes. ECM also allows staff members to scan all invoices. By applying customizable rules to designate specific levels of approval, invoices can be electronically approved and forwarded to the accounts payable department. In addition, the business office has access to the patient information needed to satisfy insurance company requirements, reducing its need to request those data from HIM. Within the HIM department, Wythe has been able to reduce paper as well as wasted time. Rather than spending an hour filing an inch of paper, it can now be scanned and quality checked in 15 minutes. In addition, 200 coding sheets can be scanned and quality checked in 10 minutes. Welker notes that once the paper is scanned and becomes part of the electronic record, it needs to be processed and it’s important to have a plan to deal with that paper. SSM has a 90-day retention and destruction policy. Because ECM touches every part of the medical enterprise, implementation requires a systemwide effort, beginning with the education of end users. Layne says clinical users aren’t typically concerned with issues such as permissions, security, data ownership, or version control. Although it’s not a deliberate oversight, these areas are not always understood. Part of the HIM department’s job is to make sure they are. HIPAA and privacy rules have proven to be a particularly thorny issue. On one hand, the ability to easily access documents allows everyone to work more efficiently. On the other hand, access to records must be balanced against the need for patient privacy and data security. Layne says ensuring patient control over who has access to data is especially important, and reconciling competing needs can be a challenge. To make sure stakeholders are on the same page, they need to have a say in the decision-making process. HIM, IT, the business office, clinical departments such as nursing, accounts payable, and the human resources director should be involved in selecting an ECM solution. From there, criteria can be established to determine specific needs. All users will have different objectives and levels of access to information in the repository, making advance planning imperative. deCathelineau recommends considering several options. Besides cost, she says there are three key areas that need to be addressed. First, does the ECM solution capture a variety of content and centralize it for end user access? Does it integrate with the organization’s EMR and make content available through its interface? And can it be used across the organization and can the ECM vendor scale as the organization grows? While these questions will require a significant amount of homework, the end result has potential benefits for the entire health system, including reducing the burden on HIM departments.